I've been looking for a good compact condenser mic for my video work on location. When I saw the announcement for the Rode VideoMic Pro Compact Shotgun Microphone, it looked like a perfect fit for my field work. After some preliminary testing, I'm impressed enough to take it on my next assignment, covering WPPI in Las Vegas later this month. Standard 9 volt battery that provides hours of work. This is important in the field. Green indicator light that lets you know the mic is on and powered up. Most of my condensers do not have indicator lights, and I'm always nervous about the status of the battery during long shoots. Three-position decibel switch (-10, 0, +20), that when used in conjunction with the manual gain setting on my Canon 60D and 5D, gives me very good control over audio levels during recording. 80 Hz high pass filter when working around the hums and buzzes of events. The condenser capsule has a supercardioid pickup pattern that's able to capture audio from the front, yet minimizes pickup from the sides and rear. Truly light and compact. Fits nicely in my camera bag. Battery compartment cover is clunky and could be frustrating to operate when having to change out the 9 volts in the field. Mount does not fit in the hot shoe of my Canon 60D. [See update at end of article for more on this. Problem appears to have been corrected. ]It's incredible that Rode could make such a big mistake here, but I can only slide the mic in about 1/3 of the way in to the camera hot shoe. Shock mount is nice, but you have to use it all the time. There is no mounting hardware for the mic itself if you remove it from the shock mount. No case is included. 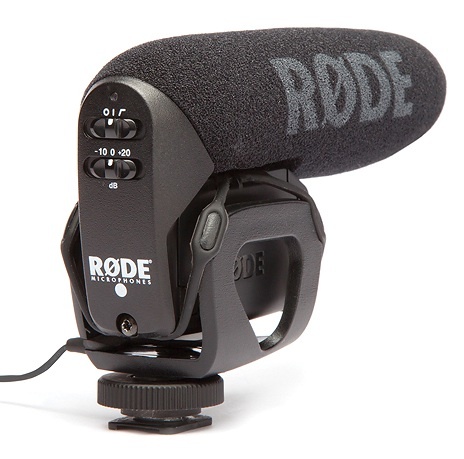 For a mic that's designed for travel, and that costs $230, seems like Rode could give us a case to protect it. Rode VideoMic Pro lists for $229. It looks good mounted atop DSLRs. It includes a solid right-angle mini stereo jack that works great with DSLRs that include audio ports. Sound quality is good, and I like having decibel control on the back of the mic. I'm frustrated with the hot shoe mount that does not work well with my Canon 60D. I'm only able to push it in about 1/3 of the way. It still works, but c'mon, nobody tested that? I would also like a second mount for the mic for those situations when I need something a bit more rugged that the rubber-band shock mount. And not including a case for a travel mic feels like penny pinching. But even with those complaints, the Rode VideoMic Pro is the best travel condenser mic I have right now, and it gives me a high quality option for those situations where lapel mics are impractical. If it holds up over time, I should be happy with my investment. UPDATE Feb. 15, 2011 -- I just received this note from Rode about the hot shoe foot on the VideoMic Pro I had tested: "We've conducted an internal audit and have concluded that this was an isolated issue that unfortunately existed in a small number of the first production batch of VideoMic Pros. Moving forward we have tightened the QA procedure for the shoe mount to ensure that this won't happen again." They sent me a replacement foot for my mic, and it now mounts perfectly on all of my hot shoe cameras. Thanks, got mine yesterday doesn't fit hot shoe either, if you spin it around mounting it back to front ie shotgun facing direction of the person holding the camera it will work so it has been assembled wrong, it's a permanent fault too so nothing we can fix sadly, so think I'll send mine back. I got an e-mail back within an hour from the global sales and marketing director saying that the new Videomic Pro was designed specifically with Canon's video DSLR's in mind and that he'd check with Rode's R&D department about the 60D. I am thinking it's a design mistake that they'll either have to fix in the next batch (if they can). But let's give them the benefit of the doubt. I have an update about the hot shoe mount for the Rode. After talking to the company, I received a replacement hot shot fitting. All I had to do was unscrew the existing fitting with a small phillips head screwdriver, then put the new "foot" on. It took about 10 minutes. Once I did this, the mic fit perfectly in my Canon cameras hot shoe mount. Not sure what game plan Rode has in mind for this going forward. I'll contact them for more information. It's a great mic, and once this issue is settled, I can wholeheartedly recommend it. thanks for the update, so the faulty foot needs to be replaced we can't just use a phillips head and spin it around like we had to do with the original when they didn't fit? Also Rode should be packaging this product better it's just thin cardboard no bubble, support = nothing, my box was literally flattened. This should be the same price as the original, sure that's "pro" apparently too, as the outside of the original videomic states "professional grade mic" neither are pro really but they're pretty good, the +20db is a great enhancement I have to admit. Seems to me that the Rode marketing department have priced this "remake" in line with the competition the very similar designed Sennheiser MKE400 maybe after they heard the US Army purchased 5000 of those aluminium beasts to deploy in some wars with 5000 5dMk2s they bought last year. That's a good read btw, check out the armys DSLR kits, google "Army buys bulk Canon 5dmk2"
Dear Rode next Christmas please don't give your kids xmas jobs assembling our microphones, because so far this has been a hassle.